Following the requirements particularly of the aerospace industry, Cevotec’s highly scalable SAMBA Series Patch Placement systems now also process prepreg material. As announced in September 2017, Munich-based Patch Placement specialist Cevotec has made highly scalable SAMBA Series systems ready for processing thermoset prepreg material, bringing along all the benefits of Fiber Patch Placement technology. 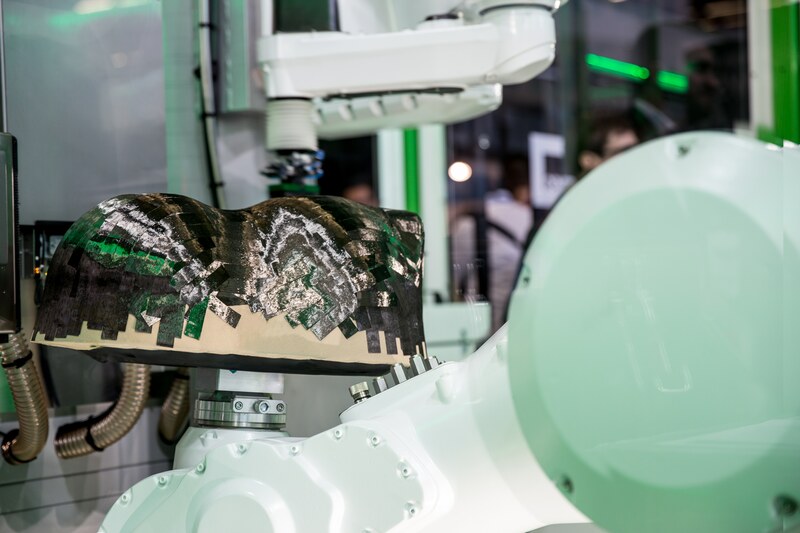 Automated fiber layup of CFRP components with challenging 3D geometries is now possible in all production environments from high-volume production to flexible batch production or prototyping. Like all SAMBA Series cells, SAMBA Series Prepreg also feature a variable and contamination free laser cutting, precise camera-controlled fiber placement and the fast and easy tool change system. Specific are a cooled material storage and an energy-efficient photonic heating of patches. For the integral production of highly complex-shaped parts, SAMBA Series systems operate with up to 12 robot axes and a flexible patch gripper to precisely place defined fiber patches on a 3D mold mounted on a tool manipulation robot. This allows for a discrete orientation of each patch and eliminates scrap as well as additional forming processes through additive, 3D net-shape preforming. Through the individual orientation of every patch along load paths, mechanical properties like stiffness and strength improve up to 150%, while the additive patch technology saves up to 30% of the precious fiber material. An even better cost-benefit ratio is reached when using the Fiber Patch Placement technology to process material that is “left over” in AFP processes: As a matter of fact, in automated fiber placement processes all bobbins of tape material are changed if only one runs out of tape during a manufacturing process. Thus, a lot of tape material is fed to a less valuable recycling or needs an expensive special treatment to dispose the uncured prepreg tape material scrap. Thanks to Fiber Patch Placement technology, this precious ½ inch-wide thermoset prepreg material can now be used for manufacturing aerospace components, which means extremely low material costs for the parts produced and extremely high material efficiency for AFP processes. Taking in account that the integral production of complex shaped 3D parts eliminates costly manual work steps and that hybrid prepreg / glass fiber production is possible, SAMBA Series Prepreg offers manufacturers a very promising new approach to automate the fiber layup for complex CFRP components. The next opportunity to meet Cevotec personally and get first-hand information about the technology will be the JEC WORLD 2018 from March 06 to 08 in Paris where Cevotec will be present in hall 5A, at booth P66. Cevotec enables manufacturers to build complex fiber composites in high volume and quality – by smart process automation based on Fiber Patch Placement technology. With SAMBA Series, Cevotec offers tailored, automated fiber layup systems for challenging 3D geometries and laminates with complex fiber orientation. ARTIST STUDIO is the matching CAD-CAM software for generating patch-based fiber laminates and automated robot programming. Along with development services that include FE-based modeling and simulation, Cevotec offers the entire process chain from digital design to final composites product.